NO AIDS 2020 IN TRUMP’S USA! 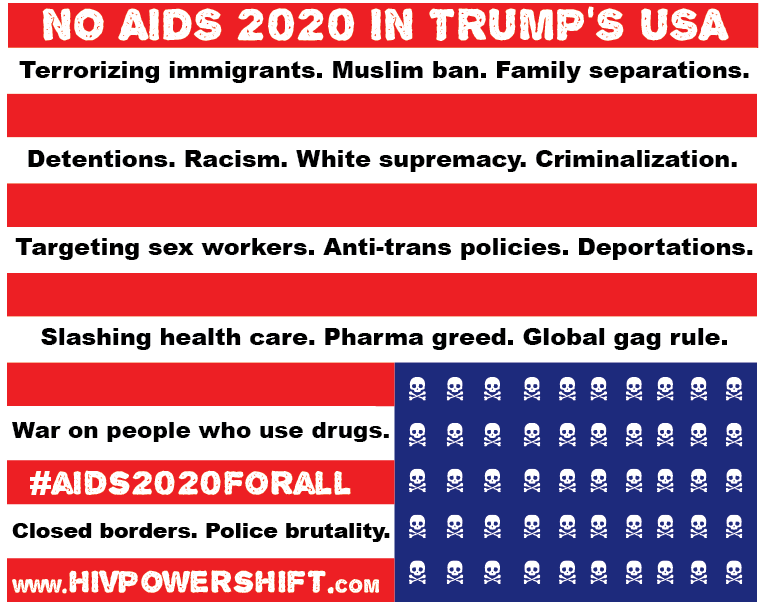 Organizational Endorsers: No #AIDS2020 in Trump’s USA! We are HIVPowerShift, an alliance of members of networks in the United States of people living with HIV and those among key populations targeted, detained, deported and tortured by the Trump regime. No one wants more strategic attention to this situation than we do. We recognize the laudable desires to showcase the achievements of the unique and well-resourced HIV efforts of San Francisco, as well as the goals of shining a spotlight on the less-resourced sister city of Oakland, and the impact of U.S. policies that hit hard in the U.S. South and across the globe. However, we need you to know this: This is a distinctly dangerous and volatile time in the United States, where long-standing biases and human rights violations against people of color, immigrants, trans people, LGBQ people, and other key populations are rapidly escalating, multifaceted and pernicious. In 1992, the conference relocated from Boston to Amsterdam due to the HIV entry ban. Based on the very values and principles that the International AIDS Society (IAS) supports, we regret to inform you that it is once again neither safe nor ethical to hold the conference in the US. IAS: Exactly how much worse does the situation have to get in the US? What other atrocities, human rights violations, and discriminatory policies affecting key populations must occur before this conference is relocated? Nothing — whether political actions, standards of civility, the rule of law and international agreements — is currently curtailing the escalation of federal or vigilante violence. Despite heroic and powerful efforts among and across targeted communities, and from grassroots to elites, we do not believe that the United States will be a safe place for members of our communities in the next two years. Further, most expect that dangerous conditions will be particularly heightened during 2020 as the nation enters a presidential campaign year — with elections just four months after the planned IAC. Locating the conference in the United States in 2020 will be a drain on limited resources desperately needed for community mobilization, rather than enhancing these efforts. Accountable networks of people living with HIV and key populations, united as #AIDS2020ForAll are moving their pre-conferences and hosting a full counter-conference in Central or South America. To honor their values, IAS must move the main conference as well. Read about the Five IAS values and their implications for the conference here.